Best Cadillac margaritas in Oregon? That is a pretty bold claim but Tacho's are certainly are among the best I have had any where. Oh and the food is not to bad either. Carlos knows his tequila. I usually only patronize restaurants with Wi-Fi, They have a pathetic signal. and there answer was sorry. If you can,t afford a measly $50 for a router, then we are done visiting. The food is pretty good, portions ok, price medium. Most of the food is average at best. The guy bartender, Carlos, likes to flirt with girls all night and give them free drinks. Most of the staff is rude and slow. I have been charged different drink prices on more than one occasion depending on who was bartending. Thefood is highly overrated and has become pricy. I wish I knew a good Mexican restaurant nearby. I'm from San Diego, CA and it took years to find an authentic Mexican restaurant. Tacho's fits the bill. Try the chile rellenos they are fantastic. I have eaten in the restaurant several times, and it's always been great. Recently, however, I had my birthday party in the cantina. I called ahead and asked if I could use their dance floor to teach Zumba to my party guests before karaoke started, and Tachos was more than happy to accommodate me. I had 23 guests, and the Tachos staff made everyone feel welcome, handled all of our (separate!) orders with ease, and really just made it easy for us to have a great time. 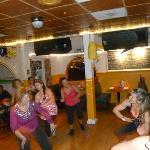 Teaching Zumba in their cantina was a really fun experience, my guests enjoyed it and the staff and other patrons seemed to enjoy the "free entertainment."